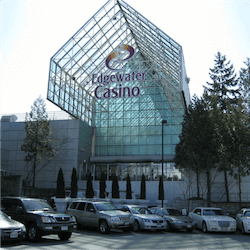 By the end of this month, the Edgewater Casino in Vancouver will close its doors, only to rise again and be reimagined in a brand new location twice its current size. Located in False Creek, just down the road from the BC Stadium, the Parq Vancouver will be the new home of the Edgewater. This new facility is purpose built to provide the city with a premium casino experience that literally doubles the floor space that is currently available at the old venue. The new casino will simply change locations, retaining its current licence which means that there won’t be any more games available to the public. That said, the current licence accounts for 75 gaming tables and 600 slot machines, so there will definitely be something for everybody. The new venue’s floor space twill top 72 000 square feet giving ample room for all amenities at the new casino. There may be plans for expansion at the new venue in the future as the original documents filed with the city by Edgewater requested licensing for 150 tables and 1500 slot machines. For now though the new space will be a roomy and atmospheric venue that provides much more room for patrons and games than is currently available. Edgewater have already announced that the Parq Vancouver casino will have 11 exclusive areas, or salons, where players can enjoy private high stakes table games and even receive food, VIP Hosting and more. They are definitely going for an upmarket look and feel to the venue in keeping with the well to do surroundings of the area they are located in. Eventually the Parq Vancouver will make up part of a whole redevelopment planned for the area including restaurants, residential units, craft breweries and more. Another planned highlight is a training rink for the Vancouver Canucks which will be a huge crowd draw. There are no plans for the current location of the Edgewater Casino once it has moved. We know that the city is planning to level the building to make more room for planned redevelopment so until that happens the venue will be left abandoned. Many current residents are looking forward to the new development plans the city has but they also are sad to see such a slice of history as the Edgewater Casino change. The new development will help reinvigorate the area and of course the extra floor space will be a welcome change for casino patrons.